The GreenFriends at Amritapuri Ashram have started a large organic tulasi garden that Amma Herself asked to be grown. 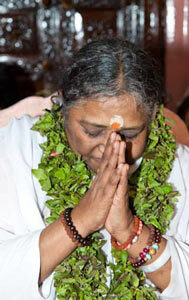 During Amma’s 2004 U.S. tour, a large packet of tulasi seeds was brought to Amma to be blessed. Amma held the seeds to Her heart and gazed at them intently with a beautiful smile on Her face. She then recalled a story She had recently told in one of her satsang, a story of the tulasi and the lotus being the flowers of self-sacrifice. 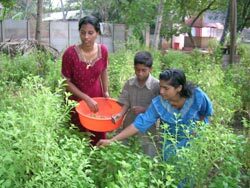 After blessing the seeds, Amma revealed that She wanted to create a large tulasi garden in Her Ashram in Amritapuri, India. barren area. However the soil was sandy and poor, and much work was left to be done. New and experienced gardeners and turned the rocky, sandy soil and brought manure from the Ashram cows in huge cartloads. One week later, the devastating tsunami struck the South Indian shoreline and rushed into the Ashram. A wave of salt water, almost five-feet tall, swept away and killed many trees and plants. By Amma’s grace, hundreds of small tulasi saplings remained safe on tables and shelves, just barley above the water level. After the water receded, the garden area was a huge sludgy mess, and all the paper waste from the Ashram was brought in huge piles and burned on the site. No one could imagine that this was ever going to be a beautiful garden. Despite this setback, Amma enthusiastically encouraged the garden work to continue. The clean up began immediately. The design of the garden took shape, with a great spiral forming within the coconut grove. At the centre of the spiral is an altar where a large, young, flowering tree stands. 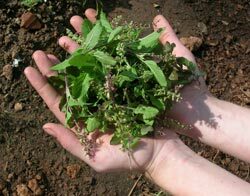 The spiral, a common permaculture design, is also an ideal way for devotees to practice the daily tulasi puja, circumambulating the plants while chanting mantras and singing bhajans. A permaculture sheet-mulching method was decided upon in order to build up the soil, and bring to make the barren, tsunami-flooded earth more fertile. Cow manure, a thin layer of lime (oyster shell), elephant manure, veggie scraps, composted coconut husk soil, dry leaves and rice straw formed the foundation. Large groups went daily to collect the materials, including canoe trips down the backwaters to the coconut soil “mountain” formed during the past 20 years by the local villagers. Vedic astrologer a Brahmachari gave his advice as to the design of the garden in accordance with Vastu Shastra [an scripture dealing with cosmic energies in relation to designs for planting, well-digging, building, etc.]. He also pointed out the most auspicious day and specific hour when the moon was in the perfect alignment with other planets for the planting of the garden to begin. On that day, a traditional puja was held. A seed-planting ceremony took place after that, and many people from various cultures and all parts of the world planted tulasi seeds while chanting the mantra for world peace: Om lokah samastah sukhino bhavantu. It wasn’t long before the tulasi seeds that were planted that day sprouted and grew, providing not only enough plants for the entire garden, but at least 1,500 more. The garden has now grown and flourished. Tulasi plants grow incredibly fast, and the many unique varieties create a sea of colour—purple-hued and all shades of light and dark green. Sweet basil, roses and jasmine (ideal flowers for companion planting) are planted between the tulasi. Tomatoes, Indian spinach (cheera), chilies and watermelon are planted at the base of some of the coconut trees, heart-shaped flowerbeds and a lotus pond are in the corners of the garden, and a “medicine wheel” of international medicinal plants has been designed near the central tulasi spiral. Composting, drainage strategies and rainwater-harvesting plans are all underway. Each week, the flowers and the topmost leaves of the tulasi are gathered in the early morning while mantras are chanted. This gives enough tulasi to make nine to 12 large beautiful malas (garlands), which are lovingly woven by hand and offered to Amma during Her darshan. The tulasi garden in an ongoing learning experience and a beautiful opportunity to do service. It holds a space for people to lovingly honour Mother Nature through prayers and contemplation, while at the same time learn practical gardening and permaculture skills. The neighbours, local villagers and their children come daily to work in the garden along with the international visitors and residents. It is an inspiring example of working together, united as one family, to serve the creation and to serve our Mother Earth.